This week is a special week, as we begin the Dusty Rhodes Tag Team Classic. 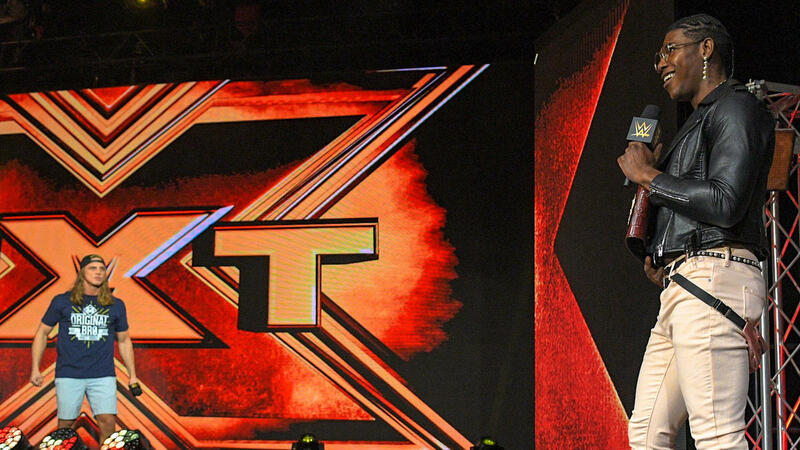 There is something special about the tournament, and I am glad that it has found a new home as it seems it will be the lead into NXT’s Wrestlemania Takeover. 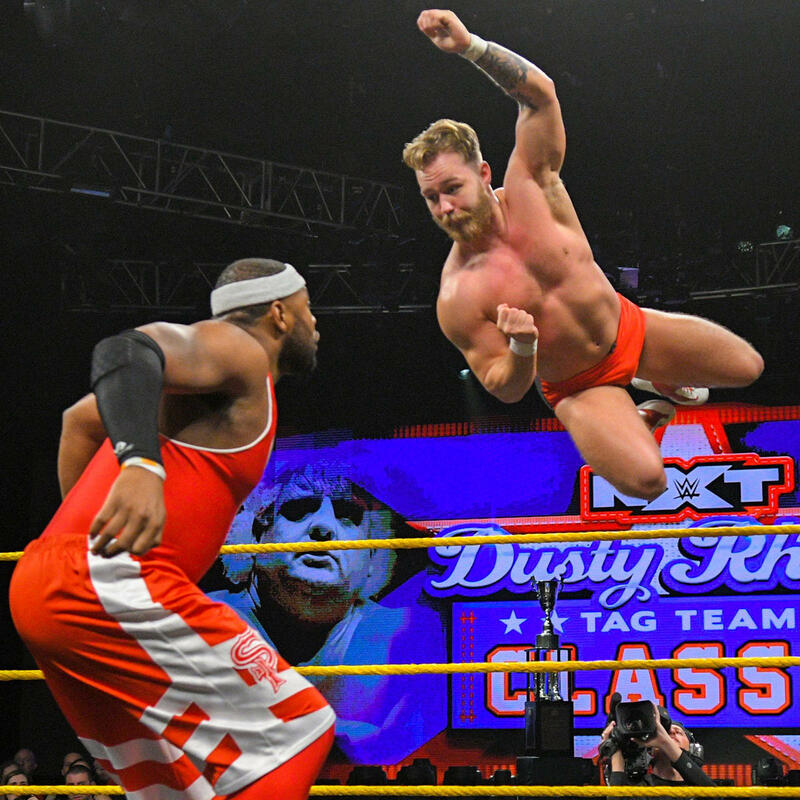 Tag Team Wrestling is something special that doesn’t get its due in the WWE, so for a few months it gets the showcase down here in NXT. Sorry boys, I can’t just muster up the strength to call them Blackochet or Aleichet. I’m not usually a fan of teams thrown together, however once they said they are there to stop the Undisputed Era, I was happy. This match brought a lot of hard hitting action from the get-go. Aichner and Barthel bring a lot of that European Strong Style, which meshed really well with Aleister Black for the first act of the match. Once Ricochet got the tag, the entire pace of the match changed. Really cool spot as Ricochet did a neck-breaker that actually made Barthel give Aichner a DDT, check it out if you didn’t watch for sure. Aichner got a close 2-count with a springboard moonsault that if you heard it was in the match you would assume it was performed by Ricochet! Really fun end to the match, as Aichner countered a high spot by Aleister Black and almost got a pinfall. Black kicked out, only to receive a European Uppercut and fire back with a Black Mass for the finish. If this is the first match of this tournament, we are in for a good one! We get a glimpse of Moustache Mountain prepping for their match, as the War Raiders look ominously from the back. Next is a recap of last week’s masterpiece by Keith Lee and Dominik Dijakovic. This leads to a clip of Keith Lee working out at the Performance Center, getting a special cheap pop by working with Eric Bugenhagen. Dominik Dijakovic came out and ran his mouth to Lee that they could finish the match right now and give Lee a ‘conclusion.’ Looks like my wish comes true and we get their re-match in two-weeks. Burch and Lorcan looking to return to the NXT Title picture, but to get there they have to get through the Forgotten Sons, who are on a roll lately. Burch and Lorcan just had a great match last week on NXT UK, so I was optimistic going into this matchup. Like most Burch and Lorcan matches, it was technical and hard-hitting. The middle of the match Lorcan hurt his lower back. It caused the team to not be able to hit a double-team. Lorcan ended up mustering up the strength to make a good comeback, only to get himself caught in (ironically) a Boston Crab. Burch made the save and we were back on. A little more back and forth, however the Forgotten Sons got the best of Lorcan and Burch. Not a bad match by any means. Of course I’m biased as Lorcan is a hometown boy. The Forgotten Sons are on the cusp of being a great heel tag team. It’s just so easy to hate them, I’m just surprised they don’t utilize Jaxson Ryker more often. I mean, why have a three-man heel tag-team and not utilize it for heat. Quick recap of the feud between Io Shirai and Bianca Belair. Next week we get a #1 Contenders match between Io and Belair. According to Percy Watson, Montez Ford came out with a mask because he planned on stealing the show. This is one hell of a matchup for a first round matchup. A lot of fun action, as both teams have very unique styles. This match we saw a different look in the eyes of Montez Ford, it was not fun and games. Montez Ford hit his ridiculous suicide dive, and went to the wrong corner to get the tag (which apparently was allowed.) After that he hit the Frog Splash and tagged in Angelo Dawkins (on the wrong corner again, which is apparently still allowed). Despite this confusion, Moustache Mountain was able to pull out a win. A match worthy of the Tournament Final, and we get it in the first round. It feels good to see Fish and O’Reilly back together. Cool pop with Ciampa calling for the #DIY entrance music to hit, however I can’t get over that Gargano couldn’t take his eyes off of the NXT Championship, but we will get back to that. Ciampa and Gargano definitely felt like a fun flashback to #DIY, however Fish and O’Reilly are the definition of a great Tag Team. This definitely felt like a great tag match, making me almost forget that Ciampa is a singles champ and Gargano a former one. The Undisputed Era got in a lot of great tag-action, mixing their MMA Striking and technical prowess. They didn’t forget the high impact tag moves though, as they maintained the upper hand for a lot of the match. Gargano took one hell of a beating, before finally making the hot tag to Ciampa. Ciampa got some great offense, including hitting O’Reilly with the Tower of London (shout out to Nigel McGuinness) and a double German Suplex. Gargano eventually got the tag and went for the slingshot DDT but got caught by O’Reilly in a guillotine for a really cool counter. Ciampa ended up making the save to keep #DIY alive. Bobby Fish nailed a Michinoku Driver from the top rope followed by a knee drop by O’Reilly and an armbar. Just when it looked like Ciampa was going to tag in, Gargano and Fish stumbled into them and broke up the submission hold. The last act of this match was high drama, with a few false finishes, but naturally the return of #DIY had to finish with the Superkick/Knee in the middle of the ring. #DIY moves on to the second round of the Dusty Rhodes Tag Team Classic. This match was great, like I said before, could have been the finals, and easily could have just been a match on a Takeover card. Ciampa and Gargano celebrated in the middle, but I just can’t help but to keep noticing Gargano looking at that NXT Championship. The War Raiders came out to the top of the stage to watch the celebration. The NXT return of #DIY is most certainly my #NeXTLevelPerformance this week. Both men jumped in an performed just like they had been tagging for years. It helps that they were working with Fish & O’Reilly, but still. Seeing #DIY together was great, but it was the side storytelling that Gargano and Ciampa had that got me. Like I mentioned, Gargano stared at that NXT Championship the entire time. Ciampa, on the other-hand, also spent a lot of time staring at that title, therefore never noticing Gargano. Sadly, we might need to wait a year to see this story end, as we heard this morning Ciampa is out, but for this, I could wait two years if I needed to.